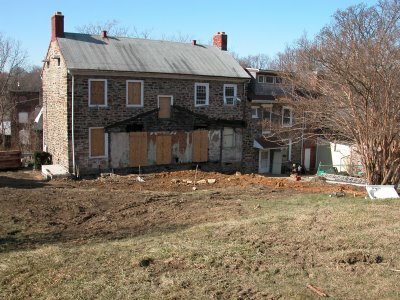 About a week and a half ago, community leader and activist Guy Hollyday called to let me know that a house on Pacific Street in Stone Hill was under rennovation, and that the owners were interested in including archaeology in the process. It turns out that the house was a large old stone farm house, which I've always thought would be an important place to dig because it seems so different from the other houses in the area. While most houses in the neighborhood are duplexes, this one is a stand-alone two and a half story with two telescope additions, which are now separate properties. 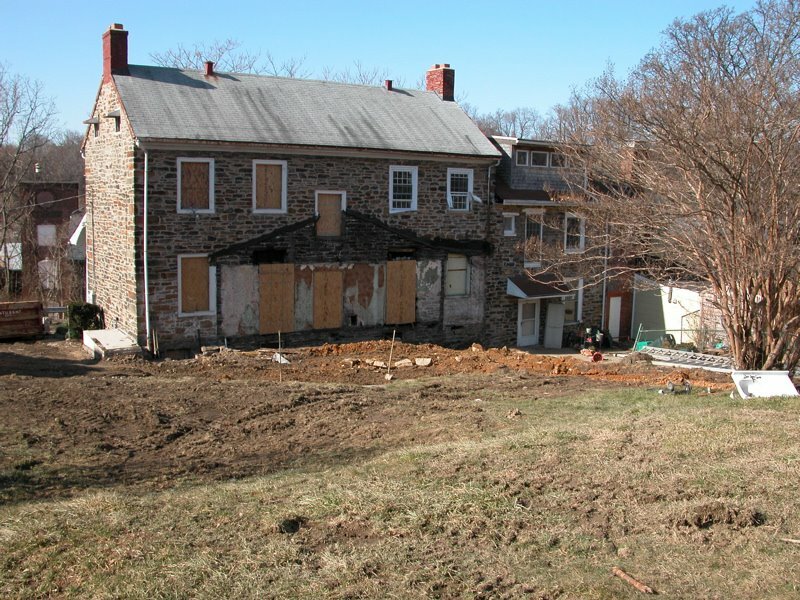 The new owners, Mark Thistle and his wife Robyne Lyles, are undertaking a massive project to rennovate the property. They've begun by stripping old paint and paper, and removing a later rear kitchen addition (pictured above). They plan to replace that addition with an updated kitchen, but before they do so, are willing to let some archaeology happen. Replacement of the metal roof is another major project. Construction workers have already recovered a number of artifactsfrom the area, such as those pictured at right, which range in date from the early nineteenth to the twentieth centuries. 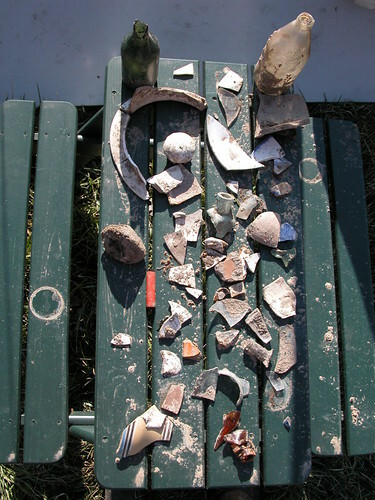 Included in this small assemblage are a number of bottle fragments, the rim of a whiteware chamber pot, a sherd of a beautiful annular-ware teapot, as well as tobacco pipes, machine cut and hand-wrought nails and so forth. I plan to do some limited excavations during the week of March 12. Likely I will dig a few shovel test pits in the area where the new addition will be constructed to see if significant subsurface deposits or features are present, but I also have a number of other research goals in mind. Included in these are the location of the building's privy or privies, location of a possible builder's trench to help date house construction (Architecural historians suspect that the house was built much earlier than the rest of the neighborhood, and artifacts from a builder's trench could help confirm this). 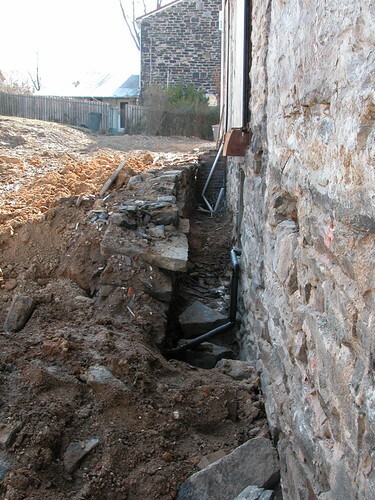 Additionally, we'd like to learn more about a strange wall and trench (pictured below) of unknown function. I've spent the last week or so trying to drum up a little grant support for this project, but to no avail. So I will be out there doing a little work over my spring break, pro bono. I would certainly welcome company from anybody interested in a little impromptu archaeology. I will likely get a few volunteers from groups around the area, but the more the merrier. If you're interested in helping out, please send me an email for further details. I will likely do the work early in the week, since I have to be out of town later in the week. If you'd like to see a few more images of the house, including some off Mark's fairly amazing handiwork check out my flickr photo set from my visit to the site last Friday. i enjoyed seeing the historical sites of hampden yesterday. I was especially interested in the work that was done in the mill, and how the mill employment shaped the lives of many of the hampden residents. I read part of Myrtle Tablott's oral history interview and I'm still shocked at how young people began working. She spoke of her mother starting work at the mill at the age of 12, which is surprising to me beceause she was a girl and because of her age. She also spoke of the sense of community that was felt among the mill workers, something that was evident in the small community of homes that we saw yesterday on our walking tour. It's very interesting to learn how our neighborhoods of baltimore were orginally formed and who lived there.